Sadly Boston’s PAX East festivities are now over, but there was a brilliant showing by iOS this year, with a record number of developers demoing the fruits of their labor. The sheer amount of iOS representation was wonderful, with at least double (or even triple) the number of iOS-related exhibitors showing off some really great stuff. From seasoned vets to first-time app developers nervously displaying their apps, iOS gamers had plenty to be excited about. Heck, even companies that were not making iOS games, were giving away iPads and iPod Touches. It was a great place for fans to finally put some faces to names and twitter handles, and try out some unexpected treats (like Playdek’s ‘Food Fight‘, Hello Games’ ‘Joe Danger’ or Owlchemy Labs’ ‘Jack Lumber’). Hopefully some of you attended the show and got a little hands on time with these really cool games and updates that will be gracing your iOS devices soon. Since there is a lot of things I want to mention, I won’t go into great detail on each title, but you can expect some more in-depth articles on a number of these titles soon. Yes!I got some hands-on time with the new v1.3 update and got to try out ALL FIFTEEN of Barry’s new gadgets headed your way later this month. As I said in my full writeup, these add a lot of fun, variety and opportunities for strategical play to the already amazing Jetpack Joyride. 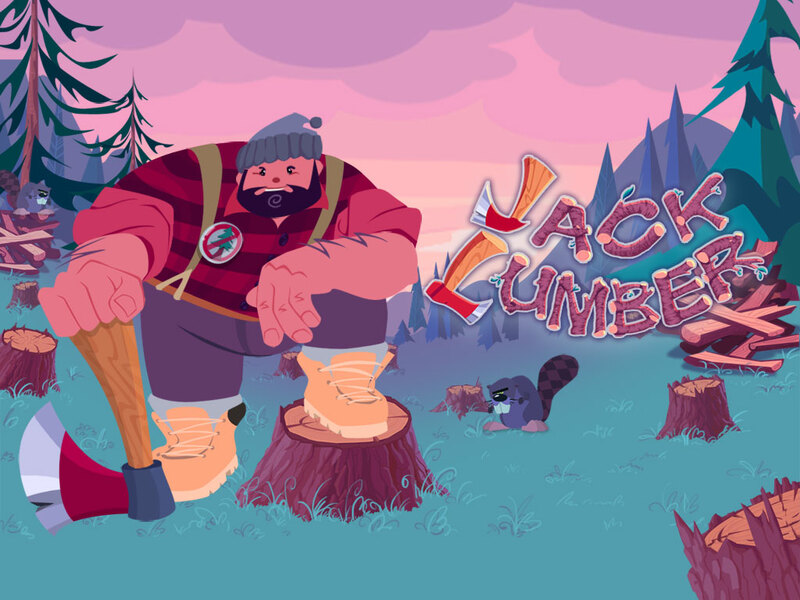 A brilliant bullet-time / path drawing game, ‘Jack Lumber’ might best be described as ‘Bullet-time Log Ninja” as it kind of blends elements of familiar games, but in a fresh, fun way. It has nice graphics, challenging gameplay and a offbeat sense of humor, or basically all that you’d expect from the company that brought you Snuggle Truck. I have no doubt this will be another hit for the studio. You can check out the official site for more info and a trailer. Between Microsoft’s “Made In MA” celebration on Thursday Night and the expo floor on Friday, I had a number of great conversations with Tin Man co-founder Neil Rennison, and artist Dan Maxwell, on topics ranging from their Gamebook Adventures and iOS development in general, to making a living on the app store, corn dogs and ironic bookmarks. You can check out my full review of their latest (and in my opinion, best) Gamebook, which you’ve got no excuse not to download, since it is free to play app. While satisfying my console gaming cravings by playing a demo of the upcoming XBLA title, Joe Danger : The Movie at the Hello Games booth, I asked if they had considered creating a Joe Danger game for iOS and I was immediatley pointed toward the other side of the booth where, to my surprise, there was a playable demo on both the iPad and iPhone! Not a port, an all-new title written from the ground up for iOS, to specifically take advantage of the touch controls and eliminate the reliance on a virtual d-pad. Using a combination of swipes, flicks and touches the controls felt very solid and responsive. While I was told that it was still in development, the game looked very polished, but had a limited number of levels. This will be a day one purchase when released, as the development team has done a great job taking a popular franchise and building it properly for the iOS community instead of just giving us a second-rate port. While wandering the aisles during the media hour before the masses arrived, we were approached by a Ghostbuster, dressed in full uniform and given a demo of a new title coming from XMG Studio called Ghostbusters : Paranormal Blast. It is an augmented reality title coming to the iPhone this Summer which uses the devices camera to cast you as an official Ghostbuster, zapping away supernatural beings with your proton pack, all in your current surroundings. Sure, there are a number of similar titles already available on the App Store, but this one benefits from having the official license to use characters and ideas from the Columbia Pictures film series. In the bit we saw you were trying to bag Slimer. Kids and Ghostbusters fans will get a kick out of this one. Robot Entertainment, was at the show too. While mostly demoing Orcs Must Die 2 for the Steam/XBLA, they did have a few iPads up showing off their (newly universal) addictive strategy game Hero Academy. I have one much in which I’m currently losing against 148Apps’ Carter Dotson, so I figured this would be the perfect time to get a little strategy advice from the professionals. After politely saying “you’re screwed”, I was given some hopefully game changing advice and a free code to download the Dwarf Team (which may still be on sale for 99¢ to celebrate the release of the all-new Tribe Team). If you haven’t played Hero Academy, then you should really download it and check it out since it is free to play! This was one of my favorite surprises at PAX East. The night prior to the start of PAX, Playdek released Nightfall, their iOS version of AEG’s popular deck-building game. All of the press release info I received from Playdex was for this title, and not being a deck-building gamer myself, I have to admit that it wasn’t really something I was particularly interested in. However, when I arrived at PAX, there was a card in the PAX Swag Bag I advertising Playdek’s Food Fight game, which immediately caught my eye. It is a super-fun strategical card game for 1 to 4 players where you must “recruit fighting entrees and side dishes to build a battling meal for the ultimate food fight”. Even with fun characters like Major Weiner and Private Pancake, there is actually quite a bit of depth to the game. The Playdek rep demoing the game did a fantastic job of explaining it and I was impressed that she managed to keep a straight face when describing the Yumminess factor, which determines who wins a hand. With single and multiplayer game modes as well as offline and online play, I was immediately hooked and have already played a number of matches with my twin brother via Game Center’s asynchronous multiplayer since getting back. 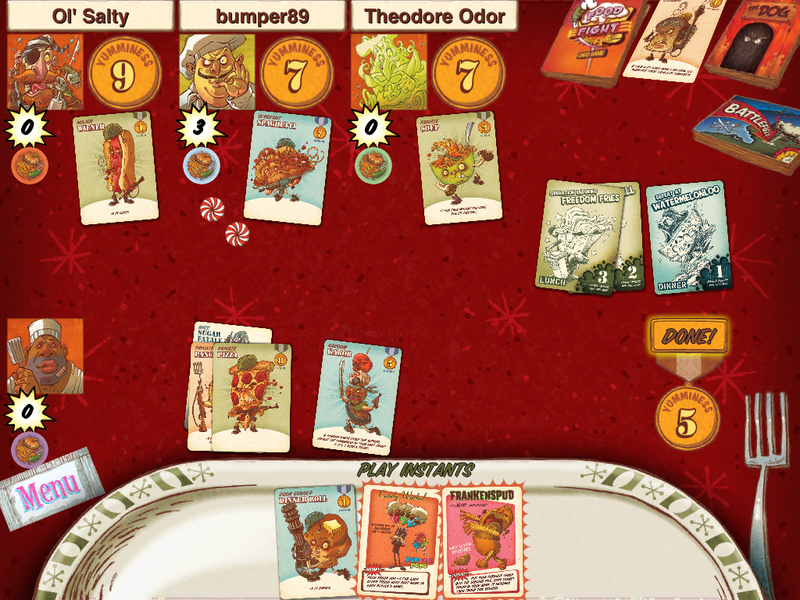 I have no idea how I missed this one when it came out in February, but I’m really glad Playdek was demoing Food Fight at PAX East! The Boston Indie showcase was a great place to see some of the cool indie titles that iOS has to offer. I finally was able to meet Vlambeer’s Rami Ismail, and had a great conversation about Super Crate Box and Ridiculous Fishing (though I was unfortunately unable to get a sneak peak of this). It was fun to see my twin brother (and SCB newbie) get decimated by the rather unforgiving SCB. Also hanging out in the Vlambeer booth were Halfbot’s Melvin Samuel and Derek Laufman. I asked them what was next for Halfbot since it had been about a year since we’ve seen a new title from them since they’ve been keeping busy with updates for their current titles and collaborative works. Well I’m happy to say that they are finally ready to dig in and begin development on one of the many ideas rolling around in their collective heads. I’m sure there is at least one person who’s name you constantly see thrown about on your twitter stream, and though you’ve never met the individual you’ve heard a lot about them. For me that individual is SpellTower creator Zach Gage. I follow a lot of indie devs on Twitter and I see his name (and game) come up a lot, so it was nice to finally put a face to a name and check out SpellTower. Sporting a number of different game modes catering to a variety of play-styles, SpellTower is a fun and addicting word puzzle game, that Zach himself described as the “Drop7 of word games”. It is available on the app store now for $1.99. 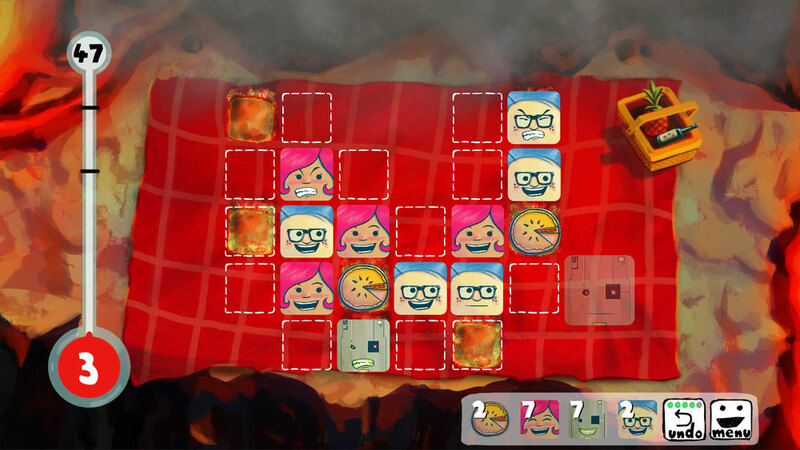 Popcannibal’s Girls Like Robots is a logic/puzzle game all about seating arrangements. Each of the cute icon-shaped pieces is a person to be made happy by seating them near friends or certain types of other pieces. Players must balance a crowd of girls, robots, nerds, lady bugs, tennis thugs, baked goods and more. While the cute graphics and name had me thinking it was for kids, the game is actually trickier than expected, and geared toward players of all ages. I enjoyed my time with Girls Like Robots and my conversation with the game’s designer, Ziba Scott. As far as mobile platforms go, he said that the plan is to launch on Android first, then follow that up with an iOS release. Since the game was developed using the Unity engine, it should make releasing on multiple platforms a little easier. HitPoint Studios had a display showing off some of their web and mobile games including Words in Space. It is word game where players try to form words by tapping on lettered asteroids to form words. You’ve got to be quick, for if too many asteroids land on your ships shield, then it’s game over. While I thought that SpellTower was easily a much more robust word game, I could see how this one may be more appealing to a younger audience. It is available on the App Store for 99¢ and there is a lite version available if you want to try it before spending 99¢ on the full release. The biggest drawback of the original game is that you are restricted to just places that are near you and that can be seen by your iOS device’s GPS. So if you don’t have a lot of places near you or many people in your neighborhood playing the game (which was the case for me, since I’m in the Suburbs), it gets very boring, very quickly. With TapCity 2, The Tap Lab hopes to resolve this one big detractor of the game, by adding the ability to travel to other locations, not just those located geographically near you. Maybe I’ll give it another go when the new game comes out. 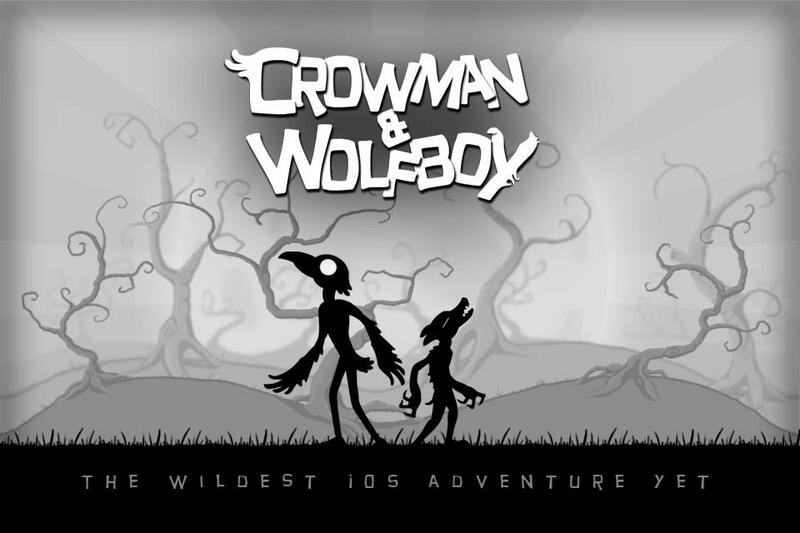 iOS new-comer Wither Studios was on hand to demonstrate an early build of their rather visually pleasing, silhouette art-styled platformer/runner, Crowman & Wolfboy on the iPad. The Kickstarter-funded game features an “unlikely pair of Shadow Creatures, on an epic metaphysical journey to escape their own nature and find a greater meaning”. With a tentacled monster hot on their tails, the game reminded me quite a bit of rComplex. However, the developers were quick to point out that is was not an endless runner, even going as far as to show me that the characters could stop running anytime you wanted. 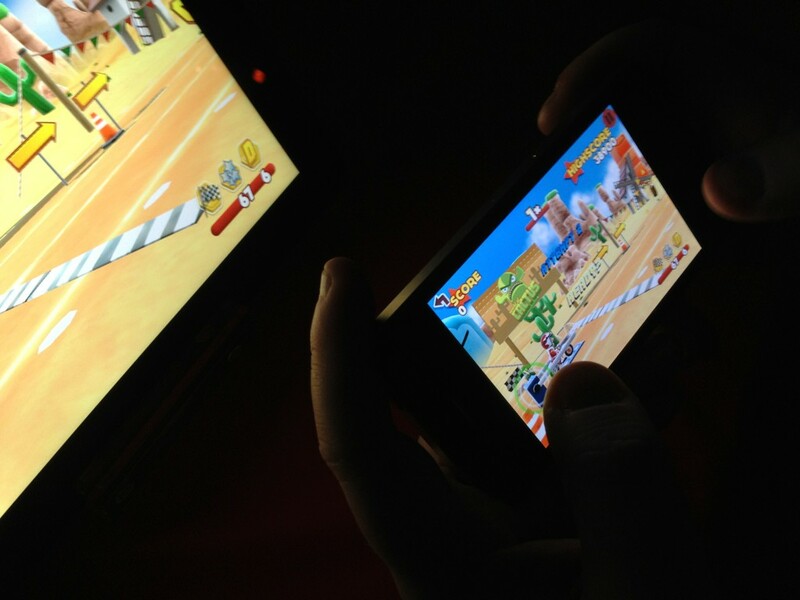 The game is still very much in development, but as it stands now, the basic movement of the characters is accomplished via tilt controls and tapping the screen causes the characters to jump. The developers are still debating the inclusion of additional gesture controls for other actions as well. While I really love the game’s art style, honestly I’m a little unsure about the tilt controls, as they are something I’ve always found a bit awkward on the iPad. I’ll save my final judgment for when the full game is available to play; there was just too little to see at this point, but Crowman & Wolfboy is one title I’ll definitely be keeping an eye on. On Saturday of the show, I was able to have a sit down with Ron Alpert of Headcase Games (180) to check out early builds of a couple of new titles they have been working on. 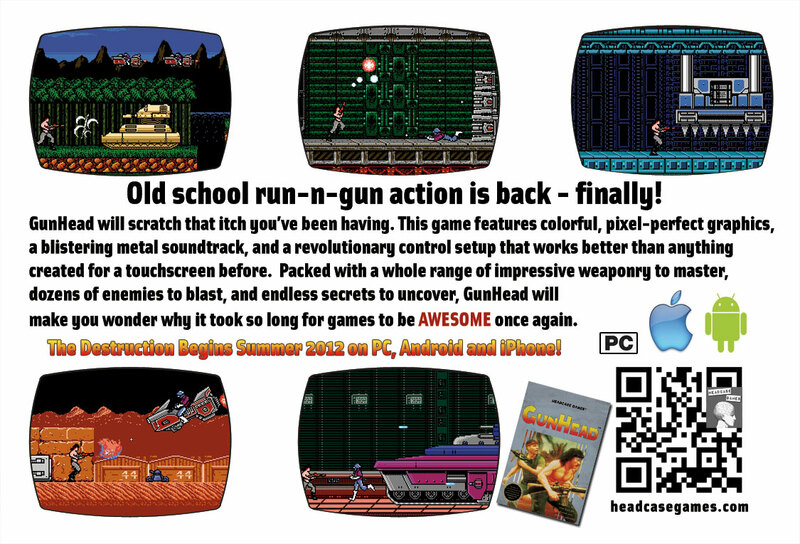 The first title, GunHead is very similar to the NES classic CONTRA, but features a very unique one-handed control scheme and plays in portrait mode. There was just the one level to play, but it truly felt like I was playing CONTRA. Honestly the one-handed controls felt a little awkward at first and I had a natural compulsion to want use two hands, but Ron assured me that this goes away quickly and soon the one-handed approach feels quite natural. To prove his point, he then quite skillfully played the game using just one hand. I’m a huge fan of retro-style gaming so this one I’ll definitely be watching. The other title, Trapdoor, is a simple pick up and play high scoring game. There are three chutes and various colored faces drop down the chutes from the top of the screen. If the face matches the current color of the bay, then you must tap and hold on the screen (on that chute) to open the trapdoor to let the face in. The colors are constantly changing around so you have to keep a watchful eye on things. There are some humorous sound effects when missed faces meet their doom and it includes a variety of power-ups to freeze time, or help you in other ways. The action ramps up and tests your ability to multi-task. It is a fun little casual game and one I’d certainly like to spend some more time with when it’s finished. Though the game first launched on the App Store last July, this was my first exposure to Bean’s Quest. It is a cute Mario-esque platformer where players control a Mexican jumping bean simply by tapping on the left and right side of the screen to change direction. This universal app is currently on sale for just $1.99 or you can download the FREE lite version. There were a number of other iOS titles being displayed as well, but I just didn’t get to everything.